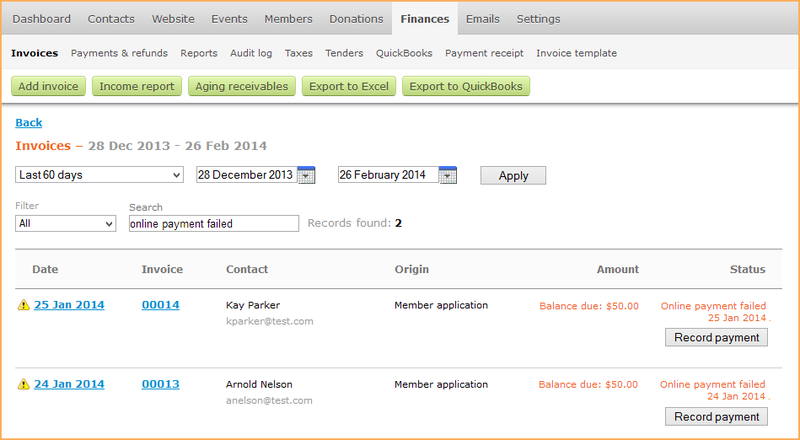 When visitors to a Wild Apricot site perform self-service transactions – such as applying for membership or registering for an event – an invoice is automatically generated (unless the membership or event is free). If online payments have been enabled for the site, then these invoices – as well as manual invoices created by an administrator – can be paid online from the contact's profile. Until the invoice is paid, the transaction is shown as unpaid and the record will show a balance due (in the case membership and event transactions). Donations, unlike all other payments, have no associated invoice, so they will appear on the contact's Donations tab as In progress until they are confirmed and completed. However, when a contact attempts to pay online and the payment is rejected, the invoice is given an Online payment failed status. If the payment is for a membership fee, event fee, or a manual invoice, the contact can just log in and try again to pay for these unpaid invoices. Alternatively, you can arrange a manual payment method, such as cheque. In this case, you would manually record the payment once it is received. In some cases, a contact may forget about or choose not to complete a transaction. In the case of membership and event payments, the invoice will indefinitely appear as Unpaid. For donations, the invoice will be marked In progress for 24 hours, and after that, it will be automatically marked Probably abandoned. There is an option to automatically cancel an event registration if the registrant does not pay the fee within 15 minutes of clicking the Pay online button. This option is available if the payment method for the event is set to online only, and appears on the event's Registration types & settings tab. If you don't believe a transaction is likely to be completed, you can delete the original transaction, which will result in the invoice being automatically deleted. There is also a possibility (although very rare) that a person has in fact completed payment, but due to a technical malfunction, this was not recorded in the Wild Apricot system. In this case, the only resolution is for the person to contact you and report the problem. Once you investigate this and confirm that payment has indeed been received to your merchant account, you can find the transaction in question and manually record the payment on the invoice. 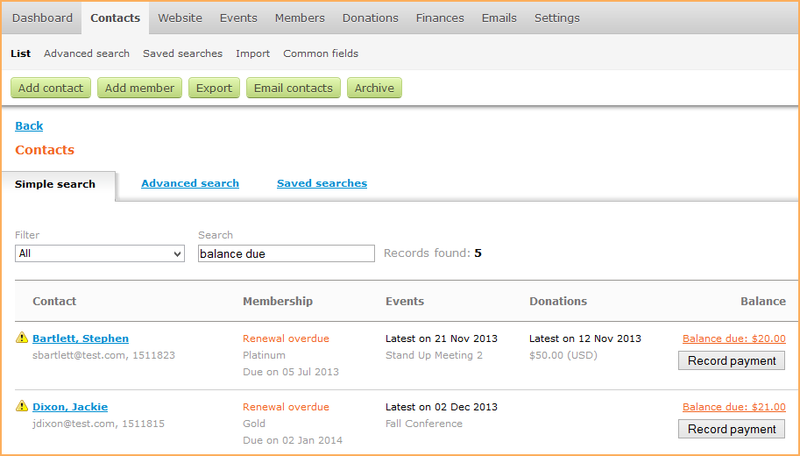 You can also check the audit log for more information on the payment.